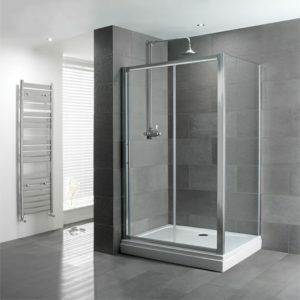 This 1850mm high vantage offset quadrant shower stall is made from 6mm tempered glass. 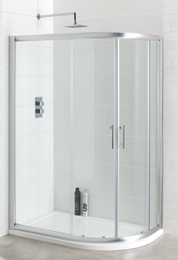 The Volente 1200 shower enclosure is a luxurious addition to any bathroom, an easy to clean, contemporary framed enclosure with tempered safety glass. The Volente 1200 shower enclosure is a luxurious, easy to clean, contemporary framed enclosure in 6mm tempered safety glass, 1850mm high. 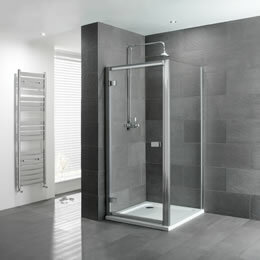 Luxurious, easy to clean, contemporary framed enclosure in 6mm tempered safety glass, 1850mm high. This luxurious Volente hinge door is an easy to clean contemporary framed enclosure. This is a glass Volente side panel of 800mm wide. 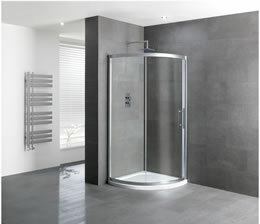 This Volente single door quad is a contemporary framed enclosure with a reversible door.